Melt Banana will be with us in just over two weeks! They play May 27th at Rainbow Warehouse, Digbeth… get your advance tickets here. With drum and bass sections now replaced by sequenced samples, the band’s live sound is more left-field than ever. 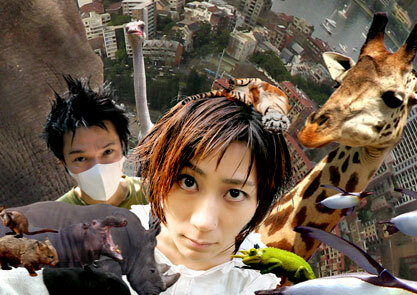 There aren’t really any bands to compare Melt Banana to, that’s how unique, weird and, frankly, ‘out-there’ they are. The best we can do is attempt to describe their sound. Imagine Tommy-gun style drum beats, ear-piercing riffs and sound effects that range from the chaotic to the hyper-catchy. Ichirou Agata emits sounds from his guitar that seem to defy logic, whilst Yasuko Onuki’s energy and vocal style is something to observe in awe. Get the idea? Well if not here’s some really recent footage of the Japanese noise-rock duo blasting through 8 songs in the space of 3 minutes! Glatze – Glatze is all about attention grabbing, energetic live performances so draws influences from the likes of Henry Rollins, Afrirampo, rave DJs such as Sy and Slipmatt, and of course Melt Banana! Thrilling Headgear – Thrilling Headgear is all about libidinous acts of creation, getting hyped off of hype stoked off of stoke.